Raid the barrel W of House 3; around the carnival area raid the barrel to the E, the big crate, the two barrels to the N and the chest. Raid the sack, wardrobe and two drawers. Raid the three bedside tables, the bookcase and the locked drawers. Raid the bedside table and the locked drawers. If you killed Aldeth Sashenstar at the Cloakwood Lodge you will be hailed by Dabron. He will attack. Kill him. Enter the Poultry Store AR0721. Kill all the Rabid Chickens. Search the barrel outside the store. Raid the barrel in the kitchen. Enter the locked house of Felonius Gist AR0719. It is best not to talk to Felonius. However if you do and say you wish to look at his statues (without offering money) he will summon two Flaming Fist Enforcers before fleeing. Free all five statues from petrification. Talk to Vail (in the northernmost corner) and demand to know where you can find the Helm of Balduran. He will give you a scroll. Then be impudent and demand the helm. The five adventurers (the others are Rance, Cailan, Faizah Tin and Achen Dell) will attack. Kill them. The scroll points to two items: a cloak with Quenash (which even without Vail's benevolence you would find eventually anyway), and the helm. Head to the back room in the Blushing Mermaid in NE Baldur's Gate. You will be approached by Lothander who informs you have been poisoned. You have ten days to obtain the antidote. Lothander will provide the cure if you help him remove his geas. Agree. He will direct you to the Diviner in the Fortune Teller's tent AR0726. Pay the Diviner to pinpoint the solution as Jalantha at the Water-Queen's House at the Baldur's Gate Docks. Ensure you speak to Lothander again before you head off to the Docks. Enter the house AR0715. Talk to Nadine. You cannot obtain her quest if your NPC Reaction is 1-7. She has lost her son and gives you an amulet to give to him. You can keep it but there are other amulets in to be found or bought that have the same benefits. 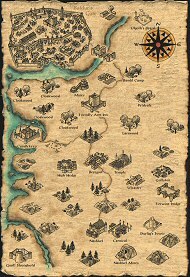 Head to an Inn in SE Baldur's Gate. Return to Nadine once you have spoken to Euric. Raid the three bedside tables, bookcase and drawers. Raid the drawers and locked wardrobe. Enter Oberon's Estate AR0143. If you talk to Glanmarie most outcomes will result in her summoning five Flaming Fist Enforcers. Go up to the 3rd floor AR0145. You will be rumbled by Helshara, Ithmeera and Delorna. If you demand they surrender the items, Ithmeera will summon three guards to assist. Kill them all. Collect the artifact, statue and spellbook from the desk. Don't be tempted to attack the hostile servants unless you want to lose a serious amount of Reputation. 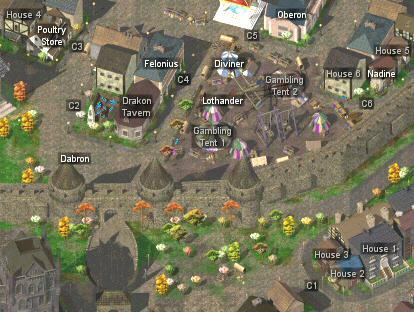 Return with the items to Alatos in the Thieves' Guild in E Baldur's Gate.